We are well into the 2018 summer movie season, and it's a good time to step away from the extraordinary heroes, superhuman villains, and dangerous technology that generally make up the blockbuster fare seeing release. Instead we'll be discussing Upgrade, a film about, well, an extraordinary hero, some superhuman villains, and dangerous technology but on a shoestring budget by comparison with the gigantic franchises inundating multiplexes. As if the cost of a film has no bearing on quality (spoiler: it never does), Upgrade is an absolute blast of an action/sci-fi picture, an uproariously entertaining experience that delivers break-neck excitement and morbid humor with a heaping dose of caution. In a nutshell, it's the perfect, and a welcome, experience for fans of blockbuster films who are looking for something outside the franchise box. Set in the near future where technology and biometric implants make life simpler, Upgrade centers on Grey (Logan Marshall-Green), a man out of place. He's more comfortable fixing up vintage cars than leisurely riding in the self-driving kind and believes the new ways of the world rob human beings of their collective humanity. This mentality runs contradictory to the views of Grey's wife, Asha (Melanie Vallejo), a successful businesswoman of an advanced, tech company. Despite their different views of the world, Grey and Asha have a loving and peaceful relationship. This comes to an abrupt end one night when their self-driving car malfunctions, leaving them stranded and vulnerable to a group of dangerous men who kill Asha and leave Grey permanently paralyzed from the neck down. Confined to a wheelchair and without his life partner, Grey is left broken and nearly defeated, matters made only worse when the police involved in investigating the murder are making very little progress. But where traditional police work fails advanced technology is able to flourish. Grey is approached by Eron (Harrison Gilbertson), a tech genius whose latest invention is STEM, an experimental implant that, when affixed, gives Grey the ability to walk and move his limbs once again. Not only that, STEM is also a highly advanced, operating system complete with interactive audio capabilities (voiced by Simon Maiden) that only Grey is able to hear. With STEM's help, Grey is able to track down and confront the men who murdered his wife and left him injured. Also with STEM's help, Grey is given the necessary skills to do with them as he pleases. Filmmaker Leigh Whannell, who previously served as the screenwriter on such modern, horror classics as Saw, Insidious, and The Conjuring among others, takes on the screenwriting as well as directing duties in Upgrade. While not his directorial debut (Whannell previously wrote and directed Insidious: Chapter 3), Upgrade acts as something of an introduction to Whannell's talents as writer as well as director. He does so, too, with furiously entertaining results. Upgrade is a highly original take on the cautionary tale of future societies, the irony of Grey's inability to accept the future world in which he presides and this new, technological gift that's been handed to him never lost. Whannell's skills as a screenwriter keeps the viewer engaged in the mystery of it all. We follow Grey along the path of clues laid out before him all culminating in a surprising revelation that seems all too natural for the man who laid out the original Saw on paper. Whannell does a superb job crafting this future world and making it seem like a natural fit for where our very own path of progress may take us. More than that, though, Whannell proves his worth directly behind the camera, as well, particularly when it comes time for STEM to show off the physical capabilities it's now given to the film's protagonist. Grey flips and fights with the skills of a master pugilist, the results of such skills generally leading to the film's healthy dosage of extreme gore. 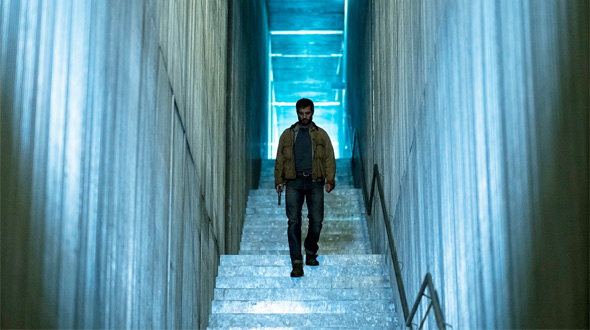 Upgrade, while an action/sci-fi film, boasts some horror-level extremities when it comes to what might happen to the human body, and, though the Cronenberg comparisons are sure to come about, the film does a grand job balancing between it all for maximum experience. Credit must be given to Logan Marshall-Green, as well, who not only does commendable work with Grey as a pained-but-pissed-off victim looking to right some wrongs. Marshall-Green's best work in Upgrade, though, comes from his physical movements under the power of STEM, the actor absolutely nailing the look and physicality of someone's body essentially being moved and controlled by a computer program. It's a unique performance, and one that fits in perfectly with the quirky-yet-energetic style of the overall film. The supporting players all do fine work as well, Vallejo and Gilbertson giving dutiful performances to their particularly straight-laced characters. Likewise, Benedict Hardie's performance as the ringleader of the nefarious characters Grey must go up against must be mentioned, and Betty Gabriel, quickly becoming a power player for supporting roles, is great as the officer in charge of investigating the film's central crime. All-in-all, Upgrade is a complete experience of an action/sci-fi movie. Though a rather simple premise, the film finds several ways to differentiate itself from countless other entries into the genre, particularly when it comes to the current state of blockbuster filmmaking. On a fraction of the budget of many of those entries, Upgrade handily blows them all out of the water, relying heavily on the skills of those involved to set it apart. The film does just that, and Upgrade serves as a thoroughly entertaining experience as well as a mark of excellence for an established writer who is finally allowed to make grand waves from the director's seat.